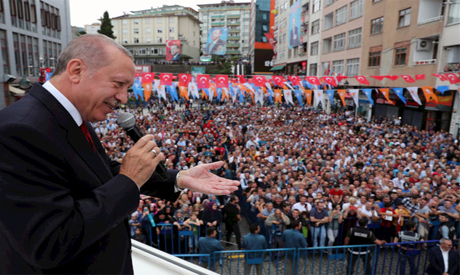 Speaking after U.S. President Donald Trump doubled tariffs on Turkish steel and aluminium imports, Erdogan described Friday's 18 percent fall in the lira to a record low as the 'missiles' of an economic war waged against Turkey. "The country is neither crumbling, nor being destroyed or bankrupt or in a crisis," he said, and added that the way out of the 'currency plot' was to boost production and 'minimise interest rates'. The two governments have been at odds over a wide range of topics - from diverging interests in Syria, to Turkey's ambition to buy Russian defence systems, and the case of evangelical pastor Andrew Brunson, who is on trial in Turkey on terrorism charges. Washington in response sanctioned two Turkish ministers and Trump on Friday announced it was doubling the tariffs on steel and aluminium imports from Turkey, saying relations with Ankara were "not good at this time". Turkey, home to the Incirlik air base which is used by U.S. forces in the Middle East, has been a NATO member since the 1950s. It is host to a critical part of the Western alliance's missile defence system against Iran.